Ideally the church itself is not made up of natural friends. It is made up of natural enemies. What binds us together is not common education, common race,, income levels, common politics, common ancestry, common accents, common jobs, or anything else about sort. . . In this light, they are a band of natural enemies who love one another for Jesus’ sake. Diversity is the effect, not the substance. The thermometer, so to speak, not the thermostat. It informs us of the spiritual temperature of our congregation, but has little ability to inflict maturity. Diversity in a local church matters very little in and of itself. It matters enormously to the extent that it advertises a deeper reality of gospel unity. Ministry by similarity is a common tool for fostering community in churches. And too often, it stems from a lack of belief. We read how the gospel united Jew and Gentile in Ephesus, but we don’t really see how it could unite single moms and retirees. I don’t believe that ministry by similarity is evil. It is just that I think it’s dangerous. Ministry by similarity can so characterize our community as churches that it obscure is the supernatural diversity that the gospel produces. Relationships of similarity offering level of understanding that is important and unique. But then — and this is the key — there should also be relationships where you are only friends because you’re Christians, without any worldly explanation. “For by the grace given me, I say to every one of you: Do not think of yourself more highly than you ought, but rather think of yourself with sober judgment, in accordance with the faith God has distributed to each of you. For just as each of us has one body with many members, and these members do not all have the same function, so in Christ we, though many, form one body, and each member belongs to all the others. We have different gifts, according to the grace given to each of us. If your gift is prophesying, then prophesy in accordance with your faith; if it is serving, then serve; if it is teaching, then teach; if it is to encourage, then give encouragement; if it is giving, then give generously; if it is to lead, do it diligently; if it is to show mercy, do it cheerfully” (Romans 12:3-8). First, we have spiritual gifts that differ according to the grace given to us. 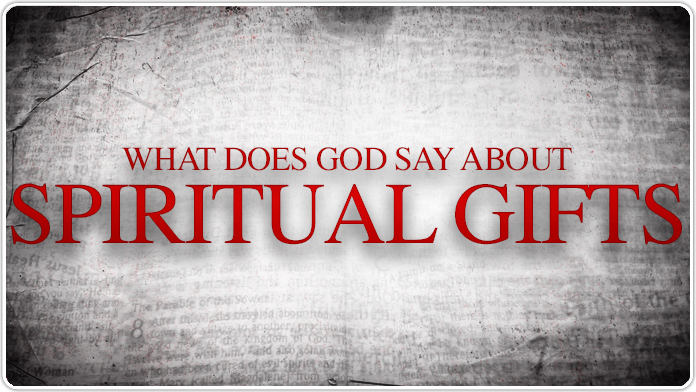 Spiritual gifts are distributed by the Holy Spirit as He wills. Both the gifts we have and the faith to exercise them are given to us by God. God’s gifts differ in nature, power, and effectiveness according to His wisdom and graciousness. Any distinction that set us apart from others in ability is a result of God’s grace—it is not earned or deserved, so we cannot boast about our gifts. I want to impress on you that God has determined the measure of each gift we have. Understanding this truth will help us to think soberly about ourselves and not too highly. Upon conversion every believer is indwelt by the Holy Spirit of God and is given at least one spiritual gift, which he or she is to then use within the body of Christ for the building up or edification of the church. As each believer serves the church, Christ uses our caring for one another to build each other up and to strengthen us spiritually. Every believer has received at least one gift from God and is to use their gift for the edification of the body. Gifts are not for a few but for all. Every believer has abilities which the Holy Spirit has given. It is one of the supreme joys of the Christian life to discover what our spiritual gift is and then pour ourselves out to others as we use our gifts to strengthen the body of Christ. A church is a body of believers where members are united in order to love and minister to one another through the use of their spiritual gifts. Second, each member functions to serve the body, not the body to serve the members. Paul uses the concept of the human body to teach how Christians should live and work together. What is true for your physical body is true for the body of Christ. Your nose is worthless apart from the body, and the same is true of your spiritual gift. Its worth is determined by its usefulness and availability to the body of Christ – or the church. A correlation exists between a believer’s physical body which has many parts with different functions and the community of believers in Christ as a spiritual body. The primary purpose of spiritual gifts is building up the body, not the personal gratification of the individual member. The diversity of the many gifts accompanies the unity of the body. We are to live interdependently with other believers. Just as the members of a physical body work together to accomplish the will of the brain, so too the members of Christ’s body are to work together to accomplish God’s will. If any member of your physical body began functioning independently of the others, or stopped functioning at all, you would take immediate action to correct the problem. You wouldn’t say, “Well, it’s just my lung. After all, I have two.” Or “I’ve got nine other good fingers; I’ll just work around this broken one.” The members of your physical body are so interdependent that they make it a priority to care for one another. In the same way, the body of Christ needs to make it a priority to care for one another because when one member suffers, we all suffer – just like a physical body. Everyone in the church is part of the body of Christ. To experience the power of the Holy Spirit in our lives to the fullest extent, we must put ourselves in a position where the Spirit is free to express Himself through us for the common good of other believers. Men and women who are led by the Spirit will exercise their gifts within the body. When we speak of building up the body, we are talking about developing a healthy body. Spiritual gifts are God’s way of administering His grace to others. When we exercise our gifts, we function as the hands and feet of Christ. When a man or woman with the gift of giving pays another believer’s electric bill, it is God’s grace. When a pastor gifted as an exhorter stands to deliver a message, it is God’s grace to the people. When a believer with the gift of service gives time to meet a need, it is God’s grace in action. In these instances, Christ is at work through His body. It is more than a matter of people beingnice. It is Christ manifest on earth. When these things happen, it is as if Christ Himself reaches down to take care of us. Many of us miss what God is doing. What we see as purely human can be a divine act. When we serve others through the use of our gifts, we are channels through which the grace and power of God are manifested. Gifts are special ways of serving others. They are not to make us feel important or superior over others. They are not for attracting attention to ourselves or a way of manipulating others because we claim to have certain gifts or insights. It is a way of helping others become what God wants them to be. When you hear about another in need don’t just stop at praying, become part of the answer. Exercise your gift. God’s plan to meet the needs of His people is His people. We meet those needs. That is why He has gifted us. After all, isn’t it a bit strange to pray for a friend who has a financial need when you have the resources to meet it? Do we think God is going to create money and drop it out of the sky? Of course not. When one hand gets a splinter, what does the other hand do? It goes to work to remedy the problem. And when you use your gift to remedy the problem of another believer, you become the hand of Christ. The body cannot function as well without you than with you. The church is a body in which each member has a significant role to play in the functioning of that body. As a member of the church, what we do or refuse to do as an individual affects the whole body. Our participation counts. God’s will for our lives includes discovering our gift in the body and fulfilling our corresponding responsibility. A believer who pulls away from the body to do his or her own thing is not walking in the Spirit. We can’t walk in the Spirit apart from functioning in the body of Christ. Spirit controlled Christians don’t function as lone rangers. Instead, they actively pursue relationships with one another. They look for ways to be involved in the body. They don’t sit back and let others do the work. Spirit-filled men and women jump at the opportunity to carry their fare share of the load. It is like when a house is being built. Each worker is dependent on the others. The framers could not do their work until the masons did their work. The masons could not lay down the concrete until the plumber had put in the piping, and so on. Each worker depends on the others to do their job for the construction to be effective. And so it is with us. We need each other to be using our gifts to build up and strengthen the body of Christ. Snowflakes are frail, but if enough of them stick together, they can stop traffic. In the same way, by God’s design, the lone ranger Christian has little impact on the world. Rather, it is when the diverse gifts of the individual members of a local church operate together that effective ministry takes place. Do you tend to be a spiritual lone ranger? If so, begin praying today that God will give you a desire to be interdependent with the body. Third, there is a difference between spiritual gifts and natural abilities. Many unbelievers have great abilities, but their abilities are not called “spiritual gifts” because they are not building up the body of Christ. No matter what abilities you and I have, if we are not strengthening others in the faith, then our ability is not a spiritual gift. It is only “spiritual” if the Holy Spirit is flowing through it. When a believer exercises his or her gift, it is a glorious display of the Spirit’s power through him. It is not simply a matter of doing something he is good at. Spiritual gifts are manifestations of the Holy Spirit. The Holy Spirit will reveal Himself in a very special way through the exercise of our gifts. To refuse to use your gift is to say no to the Holy Spirit. This should have tremendous implications for how we choose church leaders. It means that we must never simply ask, “Does he have sufficient skill?” We must always go beyond that and ask, “Is he using his gift in such a way that he is strengthening others in the faith?” A church where the Holy Spirit is alive and powerful will be a church very sensitive to the difference between natural abilities and spiritual gifts. Notice the last four gifts Paul mentions in verse 8: encouraging; giving; leading; showing mercy. The remarkable thing about these gifts (with the possible exception of “leading”) is that all believers are called to do them: encourage, give, show mercy. So the “gift” must be that some of us are enabled by the Spirit to do them more effectively and frequently than others. Any virtue in our life which we are enabled to do with passion and with benefit to others can be called our gift. A spiritual gift is any ability the Spirit gives us in order to strengthen the faith of another person and build up the body of Christ. Probably the most common question I hear in connection with spiritual gifts is, “How do I find out which one I have?” When people ask me that question, I always respond with, “What do you enjoy most about serving the Lord?” Notice, I don’t ask, “How are you serving the Lord?” I am interested in what they enjoy doing. You will enjoy exercising your gift. You will look forward to the responsibilities you are given that call on you to use your gift. On the other hand, you will not be as motivated for tasks that are outside your giftedness. If your gift involves speaking, do not rely on your own insight, but look to God for wisdom to give His words through you. We impart grace to our listeners only if we give them a word from God. It may not be an exact word of Scripture, but a word prompted and guided by God, so that attention is directed to Him, not us. Our aim is to strengthen the faith of one another through the use of our spiritual gifts. If your gift involves practical deeds of service, do not try to do them in your own strength, for then your gift would cease to be a spiritual gift. Our deeds of service must come from faith and reliance on God’s grace. Think about it this way: if spiritual gifts are God’s primary means of administering grace to His people, what does that say about believers who refuse to exercise their gifts for the good of the body? Four things come to mind: (1) they are robbing the body of Christ; (2) they are forcing other members of the body to carry their load (3) they are dead weight in the body, dysfunctional limbs; (4) they are out of step with the Spirit of God. That’s not a very encouraging report. No one is a spiritual island. Our spiritual progress, as well as the progress of the entire church, hinges on our willingness to work together. What about you? Are you plugged in? Are you using your gift for the common good of the body? Are you encouraging other members of this body to use their gifts? Or do they get in the way? You have an important role in the body of Christ, and it is a role that only you can fill. It is God’s will for you and this church to be exercising your gifts for the common good of His people. You are a unique blend of talents, skills, and gifts, which make you an indispensable member of the body of Christ. So don’t cheat the rest of us. Get out there and get busy. Whatever you do, exercise your gift. No one ever had a greater attitude about service than Jesus did. He didn’t come to be served, but to serve. Nothing was beneath His dignity. He fed the hungry, tended the sick, washed feet, and went to the cross. When Jesus was here on earth, He ministered in a physical body, but since He has returned to heaven, He is now ministering through us as His spiritual body. The strength of churches depends strongly upon the willingness of people to serve. God cannot use us in the body until we make a complete surrender of ourselves to Him. Surrender and service always go together. The two cannot be separated. It is impossible to be surrendered to God and not be busy serving Him. We cannot be a living sacrifice, and be apathetic or indifferent toward the ministry of the church. God has gifted us to serve one another. God’s ultimate aim in giving us gifts, and in giving us the faith to exercise them, is that His glory would be displayed through them. He wants us and the world to marvel at Him. There is nothing more thrilling, more joyful, more meaningful, and more satisfying than to use our gifts in the unfolding of God’s grace. God gives us gifts, so we can build up His church. To use them effectively, we must (1) realize that all gifts and abilities come from God; (2) understand that not everyone has the same gifts; (3) know who we are and what we do best; (4) dedicate our gifts to God’s service and not to our personal successes; (5) be willing to utilize our gifts wholeheartedly, not holding anything back from God’s service. As members of His body, we are to commit ourselves to God and to one another to be Christ-like in our lives and use our spiritual gifts for the purpose of strengthening and building up the body. We are to love one another as Christ loved us, honor one another above ourselves, be kind and compassionate to one another, encourage one another, comfort one another, and offer hospitality to one another. We are to let God’s light shine in and through us as we use our spiritual gifts for the strengthening of the church. God gives gifts to His church as He wills. Our role is to be faithful and seek ways to serve others with the gifts God has given us. Here are some spiritual gifts. See if you can determine which one(s) you have! In this section Paul is concerned that his previous words will be misunderstood, and so now he writes to head off any possible misunderstandings and potential errors that could arise. Paul says in verse 12 that he is not “perfect,” indicating that although he has lost all for Christ, he has yet to attain perfection. Paul seems to be warning the Philippians against becoming complacent in their new found position in Christ. He illustrates his point in verses 13-14, where he describes himself like a runner who will lose ground if he looks back during a race. Thus, he never looks back— instead he lives out the Christian life as a runner who lunges toward the finish line in a race. Or, to put it another way, Paul wants to finish the Christian life well. Perhaps Paul has in mind here Jesus’ teachings from Matthew 24:36-25:28 where Jesus taught his believers to be watchful, faithful and good stewards until He returns. Jesus said believers who conduct their lives this way will hear God say to them, “Well done good and faithful servant” (Matt. 25:21;23). Likewise, Paul wanted to run the rest of his life as a good steward of God’s grace. Thus, he strained every muscle in an effort to be faithful to God’s gracious call on his life. Another error Paul wanted the Philippians to avoid was the false belief that the end of the Jewish Law meant that one could live however they pleased. Such people, Paul says, live as enemies of the “cross of Christ” (v. 18). They became enemies of the cross because they took for granted the shed blood of Christ by indulging in shameful acts that lead to destruction (v. 19). Paul tells the Philippians to avoid such activities by following his “example” (v. 17) and to recall that they are “citizens of heaven” (v. 20). In other words, Christians should exude behavior fitting for citizens of heaven by recognizing that the earthly realm is not the sum of their existence. Rather, the sum of our existence will be obtained when Jesus Christ returns (v. 20b). On that day, believers will finally attain perfection (v. 21). Do you spend much time dwelling on what it means to be a citizen of heaven? Now that I have studied this passage I recognize that Paul is in fact calling believers to do just that. He wants us to live our lives now in such a way that we are focused on what it means to be citizens of heaven. Specifically from this text, I think Paul wants believers to live the rest of their earthly lives straining to live “worthy of the gospel” (Phil. 1:27). Secondly, he wants believers to focus on the fact that heaven will be a place of sinless perfection, and thus strive to live as sin free as humanly possible and avoid excessive earthly pursuits that have no heavenly reward. When we do that we just might gain a different perspective on how to live in the here and now. Buddy Overman is married to his wife Aleena, and has three children, Hayley, Hadassah, and Calvin. He holds a BS in Religion from Liberty University and is currently pursuing his Master of Divinity in Christian Ministry at Southeastern Baptist Theological Seminary. The final portion of Colossians 3 speaks on household or family responsibilities of a Christian. For many of us, a significant portion of our daily lives revolve around our families – some more so than others. We should come into contact with our wives, husbands, parents,children, masters, slaves on a daily basis – which makes these relationship harder than most others to manage. Expectations are higher; demands are greater, the investment of emotions is greater. Amongst all these household relationships, perhaps the most complicated one to address through a Biblical way would be that of slaves to their masters. That is the context of Colossians 3:22-24, the Biblical perspective of how slaves should perform their roles in the household. In today’s study, we will look into the definition of slaves in ancient times and in Christianity today, and how this verse should be applied to us. In the Greco-Roman era slaves were a given. Even in ancient Biblical eras – the Egyptian and Babylonian empires for example were known for their en-slavery of the Israelites. As late as the 19th Century, slavery was still a very modern societal issue. But thanks to many champions of various skin colours and continents; it is not a common issue these days. While it undoubtedly still exists in certain cultures, it has been outlawed in most countries. But while Paul was writing this epistle, slavery still exists – it was legal and it was accepted. It was expected. In my country it is common for households to hire domestic helpers – commonly known as maids; who typically come from a few of our neighboring countries. In essence, it’s more or less like a civilized and cleaned up version of the slavery systems of the old days – just that they aren’t slaves, really – they are employees and protected by the government and their embassies. You don’t own them. You cannot torture or overwork them. Most employers do generally treat them well; but there are some who treat their domestic helpers as slaves, unfortunately. The reverse is true – most helpers do their job well, but there are some who steal from their employers, abuse the children, slack off on their responsibilities. But they are not our slaves. We are not talking about our employees. We are not talking about those who are employed. What are slaves? Whatever you do, work at it with your heart – Many people tend to read Col 3:23 out of context, forgetting that Paul was strictly talking about slaves. Perhaps if Paul had the time to hold a weekly, 2 hour session on ‘how to treat your slaves’ course for masters of slaves , he would mention about treating them with all your heart at about week 7 or 8. Or maybe not. Not that masters shouldn’t be sincere towards their slaves, but that isn’t the first and foremost thing that Paul wanted to instruct them on. That wasn’t the most important issue for masters of slaves. That was the most important thing for slaves. as working for The Lord, not for men – Galatians 1:10 explains this very succinctly for us – Am I now trying to win the approval of human beings, or of God? Or am I trying to please people? If I were still trying to please people, I would not be a servant of Christ. We were slaves to sin, but by the blood of Christ we were redeemed and freed from the shackles of sin and today, if we are slaves of anything, it can only be Christ – But now that you have been set free from sin and have become slaves of God, the benefit you reap leads to holiness, and the result is eternal life [Rom 6:22]. Now before we upset ourselves by drawing on the definitions of ‘slave’ which we explored a little earlier, there is one notable difference in being a slave of men and being a slave of Christ. Slaves belong to the master, just as we belong to Christ. However, human masters did not create their slaves, they did not know their slaves from before they were born. God created us. God knew us right from the beginning. Some Christians do not accept the term ‘Christian slavery’, in fact modern translations render the term ‘slaves of Christ’ as ‘servants of Christ’. Perhaps it’s just a difference in definition. What does the term ‘slave’ means to you? If you’re upset with using the word ‘slave’ in relation to Christianity, if you are uncomfortable with calling yourself a slave of Christ, then don’t use the term. If it makes it any better, then use the word ‘servant’ – although there is indeed a difference between slave and servant. Servanthood does suggest more of an employment than a possession – which I think is the key behind why the term ‘slave’ has been used by Christians. As for me, when I look at the term ‘slave of Christ’, I really just think it means that I belong to Christ [Rom 8:9, 1 Cor 3:23, 2 Cor 10:7, Gal 5:24]. Christ owns me. Not that Christ will abuse me or torture me or render my human rights useless or take away my freewill. But he owns me. Maybe 1 Peter 2:16 clears it up a little for us – Live as free people, but do not use your freedom as a cover-up for evil; live as God’s slaves. We’re not slaves to anything or anybody in this world any longer because we’ve been freed – but this freedom is not a license for us to do evil and to sin. In other words, see ourselves as slaves of Christ – not to shackle us down, but to remind ourselves of our identity as citizens of Christ. That said, I have no personal issue with slavery – my race isn’t typically associated to slavery (I’m yellow-skinned), so if you’re uncomfortable, then just don’t use it. Our God is still the same Lord whether we call ourselves slaves of Christ or servant of Christ or citizens of Christ. I believe that given the context in Colossians 3, Paul was certainly speaking specifically to slaves – real slaves who had human masters, and who probably had to deal with complicated emotions, situations and issues – things like freedom which so many of us take for granted are taken away from them, for example. It wasn’t like Paul was new to the concept of being slaves to Christ either – he was the one who introduced that idea when he called himself a slave (or servant, depending on your version) of Christ [Rom 1:1]. Is it wrong for us to adopt this verse and apply it to ourselves in our roles as slaves (or servants) of Christ? Well, it isn’t up to me to call the shots on right or wrong, but I certainly would look at this verse in this way. Our relationship with God is a dynamic one – there are hundreds of terms you can use to describe it – father and child, teacher and student, master and slave, master and servant, doctor and patient – the list goes on. Our relationship with God is far greater and beyond that of a master and slave. But it is one part of it. Let us learn how to be sincere and diligent in everything that we do for the good of the Kingdom.